So, what does sin mean, anyway? Several of you told us you would have enjoyed joining us last week and weren’t able to. Two of you got there all the way from Oregon via skype! – thanks for joining in, Lindsey and John Biggs. Here are some of the ones who made it in person. 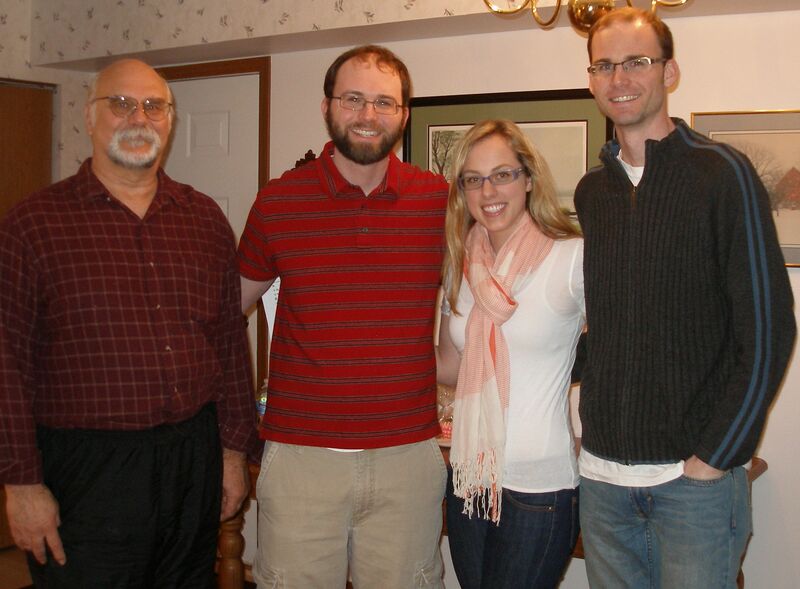 Left to right are Jim Frolic, Brian Brubaker, Amy Brice, and Brad Brubaker. Let me just share with you a little of Brad Brubaker’s terrific original song. It kind of captured the feeling and joy of the whole Gathering. Thanks, Brad! Everybody who heard it said your music was as powerful as your lyrics. Thanks also for the refreshments, discussion (even via skype), prayer, and fellowship. Come back for more … next Sunday, again temporarily at Sandi Justad’s home. Next Sunday: How can God fix what humans have messed up? It’s possible that a lot of people would put the subject of atonement in the categories of ancient history or ultra religious. But the Christian Science Bible Lesson (for April 18) called, “Doctrine of Atonement,” is a powerful subject for everybody. Whether we feel more like victims than victimizers who stand in need of God’s correcting power, we all need to figure out how to navigate human experience when relationships go wrong. Atonement is about finding the way to fix a relationship that went sour; that’s why the issues of atonement are addressed in every religion and every culture. In Christian Science, the relationship between God and humans is at the heart of every human relationship. And of course, that’s what makes atonement so very relevant to every day living. Does God make unconditional love a real possibility? Is evil inevitable for good people and bad people alike? Does God have the power to correct a mistake that has no human resolution? We still haven’t figured out quite where this Gathering is going to take place yet. Stay tuned, and we’ll let you know. Several people have asked about skyping in, so we’re going to make an effort to try that this week. Let us know here on the blog if you’re interested in joining us this week by skype.